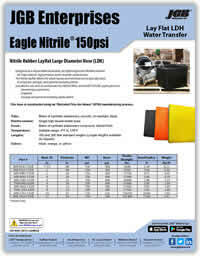 Eagle Nitrile® 150psi Layflat Hose - JGB Private Brand - Hose by Vendor - JGB Enterprises, Inc. The Eagle Nitrile® 150psi Layflat hose has been developed as a dependable & durable, yet lightweight and flexible solution for high volume, high pressure water transfer applications. The nitrile layflat allows for quick layout and retrieval and is typically used in irrigation, sewage, and general pumping duties. This hose is constructed using an "Extruded Thru the Weave” (ETW) manufacturing process.